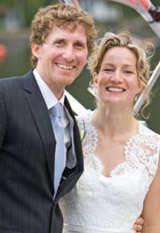 Jeff Howard and Sarah Murphy marked their marriage with the launch of the Conducive Fund. While many brides-to-be are focused on wedding cakes and flowers, Sarah Murphy and her fiancé Jeff Howard looked beyond themselves, to the common good, as they planned their September 2008 wedding. They decided to offer guests the opportunity to give back to the community instead of giving wedding gifts to them. “One of the things I appreciate most about Sarah is her philanthropic nature,” says Jeff. “So this really felt right. ”Family and friends responded enthusiastically – dozens of gifts were made to HCF honouring Sarah and Jeff’s marriage and forming the core of a fund that will help local children in perpetuity. The couple naturally turned to Hamilton Community Foundation, where Sarah, an investment advisor at CIBC Wood Gundy, is on the Board of Directors. They established a fund that will focus on outdoor activities for children and other opportunities identified by the Foundation. Sarah knows that HCF staff are in touch with community needs and can suggest grants that will have the impact she and Jeff intend. Their wedding guests were thrilled to contribute. The outdoors is a passion for both Sarah and Jeff. “Our first date was snowshoeing,” says Sarah, “and Jeff proposed on a ski hill. So that gives you an idea of how important outdoor activities are to us.” Even their wedding was held outdoors at a summer camp; guests were able to spend the weekend enjoying both the outdoors and the camp experience first hand. The couple aims to make opportunities like summer camp and other outdoor adventures available to less fortunate children through their fund, named “The Conducive Fund” to suggest its ability to produce a favourable outcome. They have also directed a portion of their fund to HCF’s unrestricted fund, which gives the Foundation flexibility to meet changing community needs.